"In August of 1994 a White Buffalo Female Calf was born. This tells us it is time to take our rightful place in leading the people toward peace and balance once again. We will be strong and the people will heal. Our healing is global. "On June 21 1996 we will return to the sacred Black Hills to pray for peace. We will pray for the return of our holy land. We will pray for the two-legged, the four legged and winged ones and for Mother Earth. "We ask that you pray with us. Indigenous Nations know our Mother Earth is suffering. Humanity is heading toward total chaos and destruction. "That is both a scientific and spiritual fact. "As caretakers of the heart of Mother Earth, it is our responsibility to tell our brothers and sisters to seek Peace. We ask every nations to declare June 21 World Peace and Prayer Day. Pray at this time with us for your sacred areas." Since this time I have had resounding responses from both Indian leaders and spiritual leaders around the world. In March of 1995 I had meetings with Liberal Member of Parliament Elijah Harper, who is a high profile leader who stopped the Canadian Constitution legislation because it did not recognize Aboriginal rights. He has committed to helping June 21 become a legal holiday in Canada. Also, I met with Chief [of the Assembly of First Nations] Ovide Mercedi, who represents over 500 tribes in Canada. Ovide is in full support of June 21 and is beginning the groundwork to gather elders and spiritual leaders this October to ensure that all tribes participate June 21, 1996. In May, 1995, there was an international gathering of spiritual leaders at Six Nations, Canada, which focused on the prophecies of Indigenous people and what we are to do at this time as a people. The Cree from the north agreed to support this day with us and pray from their sacred site and to host the June 21, 1997 World Peace and Prayer Day. The Mayans talked of the time when the spirit of the white Jaguar is to be released and that last January over 900 medicine men gathered to write their prophecies on the wall of the Temple of the Sun. The man from the Malaysian rain forest talked of the disease elders said are coming - tears of blood will stream from the children's faces because they are uprooting ancient trees that hold in the underworld. He agreed to take this message to over 11,000 rain forest Indians and committed to support and pray with us this June 21 from their sacred site. The Maori spoke of the children suffering starvation as the world is going to shift and cleanse herself if we do not listen to the prophecies instructions to return to our spiritual ways and use the knowledge that our ancestors left us. They said they will pray from their sacred mountain, which is the first mountain to greet the rising sun. I could go on and on, but you get the picture. I was asked to speak to the Dakotas, Nakotas and Lakota chiefs and delegates about the traditional knowledge of the Pipe and prophecies at Summit VI. We have relatives as far north in Canada as Alberta. We have forgotten about these people and I have been working toward helping them reunite with the southern relatives. I had a dream on the way to the summit. The dream was of the "ride" where my grandfathers were coming toward me. In full headdress and buckskin, they came through a cloud of dust. I felt like a young child. I wanted my headdress, the one that was placed on me when I was 12 years old, but I remembered the mice had torn at it. Just then someone stuck a full headdress under my right arm. In the dream I wanted to ride with my grandfathers. It was a day I had waited for all my life. I told the people at Summit VI that I would be leading a unity ride through Canada to reunite our relatives this coming July. I believed the dream was of the upcoming ride in June from Canada to the Black Hills. I traveled to Joseph Bighead, Saskatchewan to visit with a traditional Cree man, Chief Ernest Sundown, who wished to present me with a trailing headdress for my commitment to unity and mending the sacred hoop since 1986. From there I traveled to Pheasant Rump, Saskatchewan - a Dakota reserve - and gave nine names to young men and women. The family presented me with a yearling horse. We rode 500 miles from Pheasant Rump to Wahpeton, Saskatchewan in three weeks. The elders greeted us from each community, sometimes with a Pipe. Chiefs joined us, wearing their headdresses and carrying their staffs. We would be led into a tipi to speak of prophecies and smoke the Pipe. Each nation honoured us and committed to June 21, 1996. Some said they never thought the message would come to them from their relatives to the south. They never thought they would live to see this day. From Wahpeton, I hurried to Green Grass where we had organized a gathering for two days to talk about World Peace and Prayer Day with our own people, the World Council of Churches and members of peace organizations. From there we traveled to Pine Ridge, and again I spoke of my whereabouts and the push for the World Peace and Prayer Day. During this time I also dreamt of Sun Dancing. I had never had this dream before and was told by the elders when they made me Keeper of the Pipe and chief, "You do not have to Sun Dance because your whole life will be a sacrifice for the people. The people take care of the Keeper so you never work because you are the center and cultural carriers." My decision to Sun Dance was a commitment to pray for the people for things to change for the good as they were not good now and seem only to worsen. My brother Ivan's vision was from the "hill". It was to go back to how the Sun Dance was originally formed. We honor his vision and commitment to strengthen the ceremonies in a good way. It was the right time to Sun Dance. It is time for me to remind the people that I have two titles - one as Keeper of the Sacred Pipe and one as chief. To our knowledge no other Keeper was given two titles or burdens at such an early age. With this great responsibility at a time the people were suffering from all the effects of genocide and religious suppression, Alcohol and abuse was the way of life we saw. I am trying to change that cycle of abuse we have toward one another. It is not a easy time to be the spiritual leader of this Nation. There is literally no support from the people. Our family has long been persecuted from remaining Lakota and traditional culture keepers. As keeper and chief, I ask people to look at the big picture. Look past your own personal situation and ask what have you volunteered for your people lately. I don't expect all people to support me as it is as the traditional Lakota elders said it is to be, but at least show respect for our ways and prophecies. Our cycle of life where there is no ending and no beginning. Arvol's statement appeared in the newspaper: Indian Country Today- South Dakota, USA: Week of August 31, 1995. He recently asked that it be republished here to explain to all what's been done in planning the June 21 World Peace and Prayer Day, who is supporting it, and the spiritual reasons (shared by many indigenous spiritual people, who will be conducting prayer ceremonies June 21 at their sacred places) that are its foundation. A Canadian supporter emailed it. I'd like to receiv more materials about the Unity Rides and speaking engagements and events with our relatives in Canada of the BigFoot Riders and any and all plans to conduct sacred site ceremonies this coming June. Text and graphics copyright Paula Giese, 1995, 1996. Photo of Arvol by Dan Budnik, from The Book of the Elders, Sandy Johnson, Harper SanFrancisco. c. 1994. 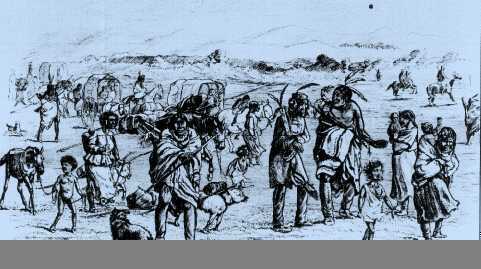 19th-century Drawing of Wahpeton Dakota refugees arriving at Saskatchewan I found on CanadaDisk (2200 historical images) of Canada's SchoolNet, resized and colored by me.